Organic Lucky Dragon Hyson (China) - 4 oz. Contains very high antioxidant level of 11.4% vs 5-6% for mass-market teas. Character: Greenish yellow color. There is good body in the cup and smooth fresh greenish tasting liquor. Bold and full flavored with hints of pine on the finish. An excellent example China green tea and a great value. Hyson translates to “Flourishing Spring” and this particular varietal imparts the fresh green character you would expect to be a part of any springtime tea experience. Typically bright on the nose its scent hints at spring, the season in which it is produced. In the cup the tea is equally bright, round and full bodied with a touch of grassiness. During the 18th and 19th centuries, Hyson was one of the most popular teas on the market, prized for its warm character, bright cup and overall sunny disposition.This tea became so highly favored in the 1700’s that the British Tea Tax was actually higher for this variety over other teas. 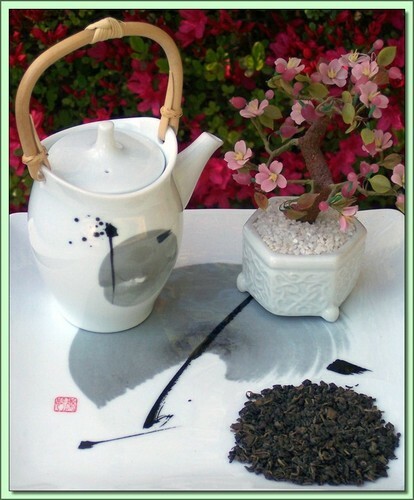 Lucky Dragon is from a specific factory that further identified their tea because even though produced in the young hyson style it is much better than typical young hyson. Certified Organic by QMI Organic Inc. Certificate #: 150 - 2008. USDA Certified Organic. Hot Tea: This tea is best enjoyed by pouring 212F/100C (boiling) water over the leaves (1 tsp per cup) for 7-7 minutes (longer=stronger). Don't remove the leaves. Can be infused repeatedly 2-3 times using higher temperatures & shorter infusions until flavor is exhausted.